Posted by qmediawatch in Uncategorized. The QueerMediaWatch on wordpress.com transitioned to Twitter in 2009. Posted by qmediawatch in Homophobia. Posted by qmediawatch in Online/New Media, Section 377. Posted by qmediawatch in Biased/Homophobic. The reporting of the Pride events in the Indian media has been overwhelmingly positive. However we note that there are some exceptions. The Tamil media other than progressive magazines like Kalachuvadu chose to be largely silent on the issue. 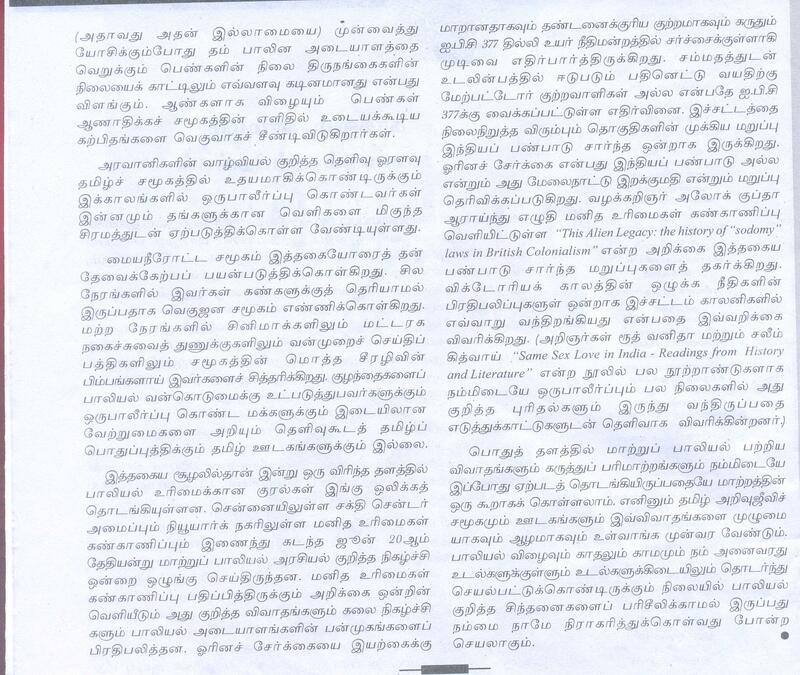 Among these the reporting in Dinakaran has been particularly bad and the reporter chose to focus on how the marchers dressed and used words irrelevant to the pride event. Posted by qmediawatch in Section 377. With this hopefully the 377 watch section on this blog will come to a close. Posted by qmediawatch in Pride 2009, Pride 2009 - Chennai, Times of India. Posted by qmediawatch in Pride 2009, Pride 2009 - Chennai, The Hindu. Posted by qmediawatch in 1. Posted by qmediawatch in Pride 2009 - Bhubaneswar, The Hindu. BHUBANESWAR: People belonging to lesbian, gay, bisexual and transgender groups took out a rally here on Saturday, demanding their right to life and dignity. Christened ‘Rainbow Pride Walk,’ the rally was attended by those from sexual minority groups.